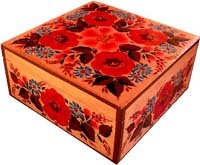 These Russian boxes come in many shapes, sizes and designs. The interior of the Russian boxes is lined with different color fabric. You can use it for jewelry or any other decorative purposes. They are very bright and match almost any interior in your house or office. These Russian boxes are wonderful gifts for any occasion. Also, they are very collectible because they were made in USSR.